Lily Hope is officially two. We celebrated yesterday in our family's traditional fashion- just us and no one else. A fun, simple party at home. 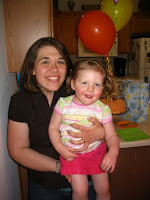 I can't tell you how nice it is to have sweet, small, uncomplicated birthday parties at home. I know that in the years to come there will be parties full of friends, but we'll always have our "home parties" too- just a time to celebrate and remember- without the crazy. 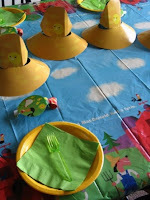 Lily Hope, we celebrated you last night with an Old MacDonald party, complete with farmer hats. 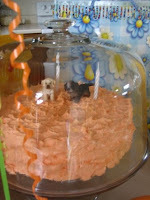 You loved all the animals and especially loved the cake- because you made it with me. You patiently waited on the counter, while the mixer did it's job to make the fluffy frosting- which you chose to be orange. Two little puppies were on the top- you picked them out yourself, loving that one looked just like Grandpa's dog, Lucy. We ate pizza, of course, and even though the tornado sirens interrupted your party, the fun continued in the basement. Your sisters were instructed to sit with their backs touching the couch so they wouldn't be tempted to jump up and touch the gifts as you opened them, because those were your gifts, and this was Lily's day. They chittered like squirrels throughout the entire gift time, but mostly obeyed. You graciously shared your play doh when all was done. A bit of the aftermath is still strewn about the house, but it was worth every bit of mess, because you had fun and we had a chance to make a special day to celebrate the joy in our hearts because of you. You're our sweet one- always have been, always will be. Big feelings, big sweetness. That's you, always. But the sweet always wins out. We are so thankful you're ours, and although you may feel shoved to the middle at times, between bossy bigger sisters and a demanding little brother, I want you to know we couldn't be happier that you're with us, and we'll always fight for you to get your special attention too, so you'll never get "lost" in the middle. We love you very much and are so excited that you're two, Lily Lu. I'm off to tackle the aftermath, after some reading and some coffee. My morning will be spent with busy tasks, but, that's OK. Lily, I know you'll be right there with me, "helping" all the way. Happy Birthday, Lily! Congratulations Megan, for making it this far. I don't know how you do it!! The birthday party sounds like a blast. I love your family traditions, they are SO sweet. Lily sounds like an absolute doll & it sounds like her birthday was as sweet as she is ;) What loved, lucky children you have, Megan! 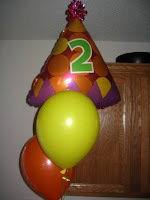 Happy number two, Lily! I love at home parties with just our little family. Those are my favorite - besides, it means that there will be cake left over for subsequent nights :) I have my priorities, you know. What a sweet girl your Lily is - I just love how you are so intentional with making sure she gets the special attention she needs. She will always love and appreciate that. Have a wonderful year Lily!!! I love it! We call Olivia: Livvy Lu! Somehow Lily Lu just rolls off the tongue, too! Happy Birthday! And we only do family birthday parties for our kids when they are two. Glad to know I am not the only one! The farmer party is great! Love the tradition of celebrating with just your family. Pizza and cake is a great way to celebrate! I call Lexi "Lexi Lu" also!